Eat Your City: Sushi Wasabi Edmonton, AB - Back again for tasty sushi, Alfonsino and fish eyes?! With a craving for sushi, we head to our favourite Japanese family run sushi joint in town, and got talked into trying one of their specials. So rather than ordering our usual, we have a truncated order of our favorites and the special. For the other times we've pigged out and remembered to bring a camera, you can read our first review, second review! The place is packed, and we can hear Mama-san cheerfully orchestrating the kitchen in Japanese. We grill the waitress about the Alfonsino special - what is it? How is it prepared? Alfonsino is also known as Kinmedai or 金目鯛 or Golden Eyes Seabream. A popular fish in Japanese restaurants, and they had some fresh here! She eventually went to go get the chef and he gave us a more detailed explanation as he knew our table always tended to be more curious about his food than others. We then sat back and enjoyed some fragrant green tea with roasted puffed rice while our food was being prepared. We start off with a small bowl of wakame salad a favourite appetizer of ours. 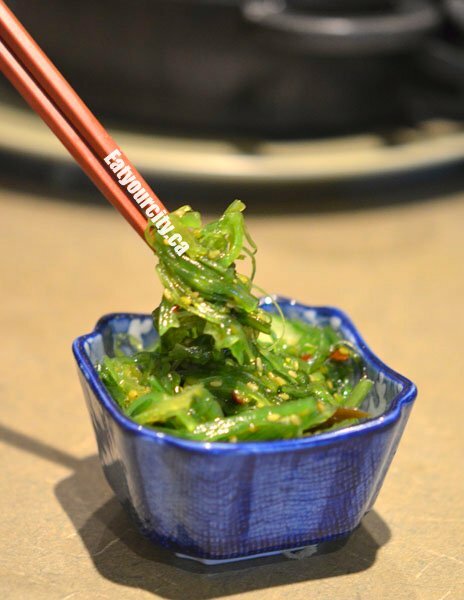 This fresh verdant green seaweed is precisely cut into thing little ribbons and marinated in their secret slightly sweet sesame oil and rice vinegar based dressing with just a small hint of chilis. Garnished with thinly sliced cucumbers, this tangy and super addictively tasty salad disappears like magic. Too bad I can't wave a magic wand and have a mixing bowl of this salad everyday. Nom! Next was our two orders of tekkamaki - small bite sized tuna rolls cut with precision. You can line them all up and they are (usually) all the same height. 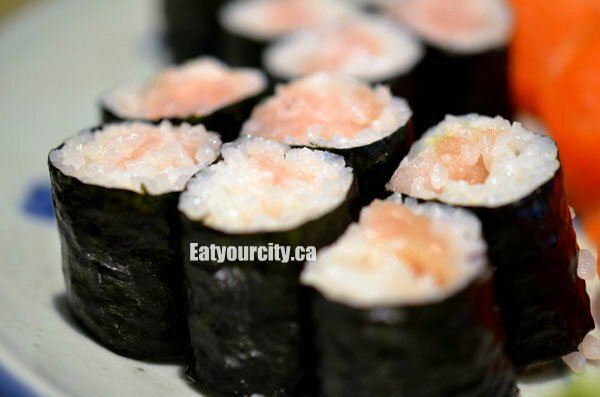 The sushi rice is well seasoned, with a hit of tanginess from the rice vinegar, working well to balance the slightly sweet-salty creamy tuna hidden inside. Nom! Because we couldn't decide how we wanted the fish done, the chef kindly divided half the fish and prepared a quarter of it as sashimi. 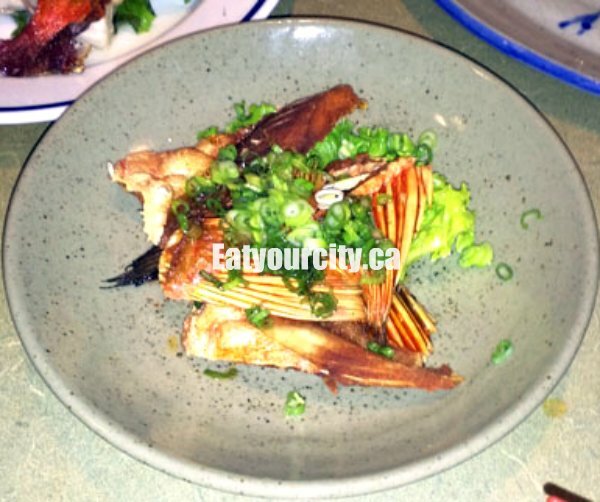 The fish is sliced beautifully, with a natural silvery sheen. 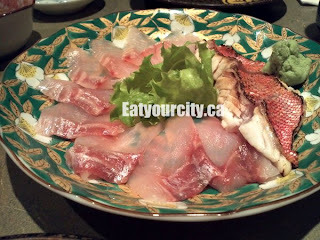 The flavor and texture was a blend of sweet hamachi with mackerel-like notes. The other quarter was gently seared so only the skin was crisp, yet the interior was still cool and silky, this tetakki was amazing by itself. We couldn't come to an agreement if it was better with the chef's secret ponzo sauce loaded with grated diakon. Soooo good!!! 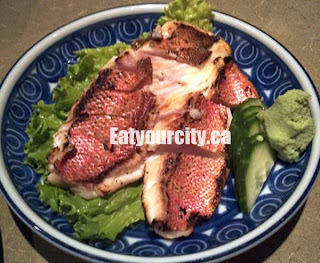 The tetakki style Alfonsino won by a thin margin against the Alfonsino sashimi, so the we asked the other half of the fish be prepared as a tetakki as well. Its a shame this fish is only in season once a year... Nom!!! So a quarter of the fish has been eaten sashimi style and three quarters of the fish has been eaten tetakki style. What's left to make two more dishes? Well, the chef has never led us wrong, and tonight, was the first time I experienced eating the eyes of a fish. Yup. Eyes. We we're pretty skeptical, but the chef insisted its the most sought after part of the fish, so we said okie! And soon we were tentatively poking at the grilled fishhead. Now we know why its called the "Golden Eyes Seabream"! The chef came out again to explain we only eat the outer part of the eye, not the white pearl inside... and it was really tasty! 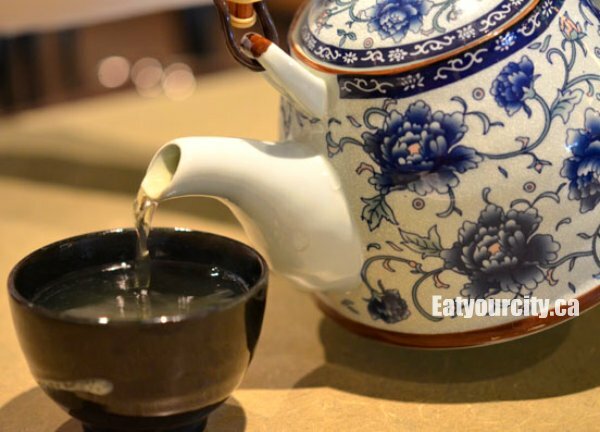 Once you got over the ew factor, the part we were supposed to eat, taste like a rich seafood broth. We also worked out little tender bits of grilled fish off the head, and we found the fish took on a flavor profile very similar to mackerel once its cooked. We rounded out the meal with a few nigiris - scallop, bean curd, sake (salmon), and maguro (tuna) - sorry no pics as we started eating them before we remembered to take a pic. Overall, yet another amazingly tasty meal from Sushi Wasabi. 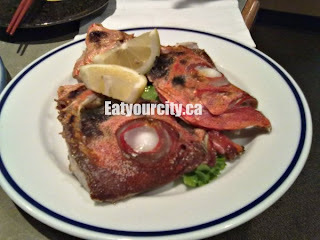 I hope we get to try their Alfonsino special again sometime.. hopefully I don't have to wait till next year. Gochisousama deshita - Thanks for the feast!